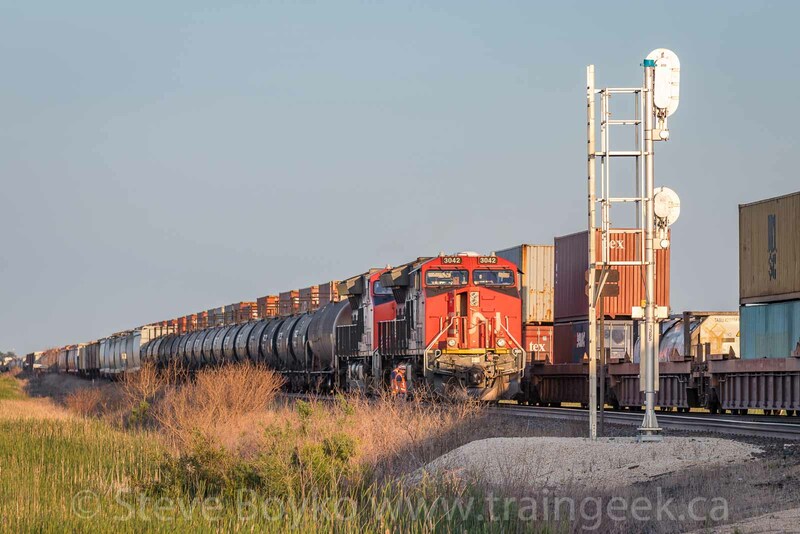 As railfans, we get caught up in the details of locomotives and train operations. "Is that an ES44DC or an ES44AC? Check out those giant radiators on that Tier 4 locomotive." Sometimes we have to stop and smell the roses... or sunflowers, in this case. I was out looking for trains a few evenings ago, and I found one getting ready to leave CN's Symington Yard in Winnipeg. I set up for a "meh" shot - the light wasn't great - and then this hump yard set of power rolled in the way... so they got to be in the picture instead. It's funny how shooting into the sun really strips the colour from the image. When processing the photo above, I decided to make it a black and white image as there wasn't a lot of colour anyway. Contrast that with the image below, taken half a minute later but facing away from the sun. 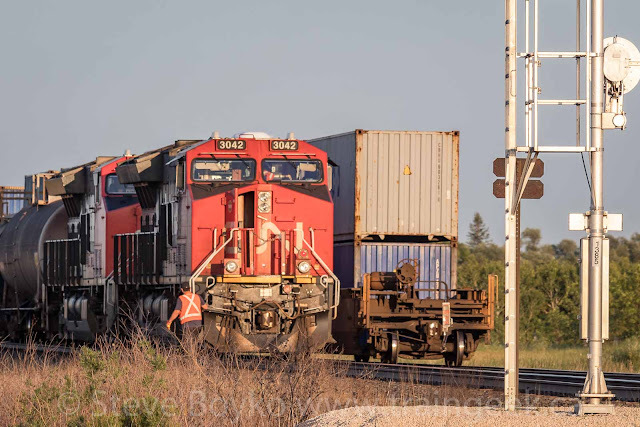 I've noticed that the SD40 sets of hump yard power seem to be used more often than the older GP38 sets, so I have been trying to photograph the Geeps. I drove around to Symington Yard proper. I spotted a line of shiny grain hoppers in the yard, so I took a few telephoto shots of them. They are GrainsConnect hoppers. Presumably they are for GrainCorp's grain terminals in Maymont, and Reford, Saskatchewan. They are building two more, in Huxley and Vegreville, Alberta. Of course, GrainCorp also owns Canada Malting, which has a few grain elevators across the prairies. I found it interesting that these cars all have "dents" in the same place. It must be part of the manufacturing process as I can't imagine they all got banged up so soon. Driving back toward CN Navin and the southeast corner of Symington, I saw that the train I saw earlier was on its way. 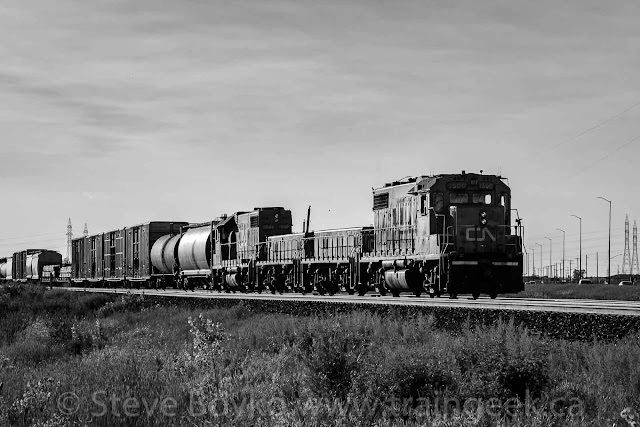 I headed east on the Trans-Canada Highway (which parallels the CN line for quite a few kilometres), looking for a good location to make a photograph. 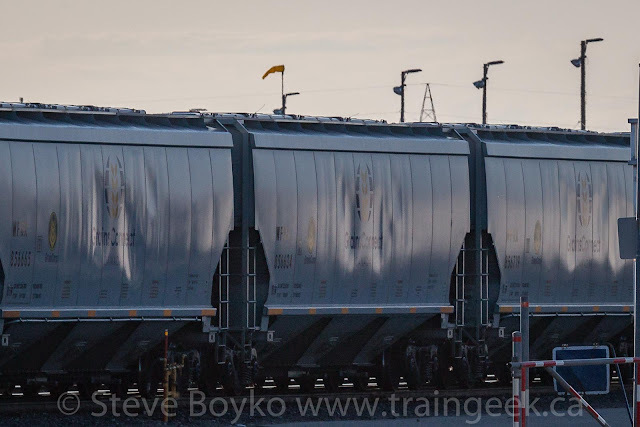 I was mindful of the sun's position, mostly behind the train, so I thought a side shot would be better than a "glint" photo toward the sun. When I spotted a field of sunflowers next to the tracks, I knew I had my location. I exited the highway and drove around the field to position it between me and the tracks. Not long after, CN 3062 East came rolling along. I fired off a series of frames as the train came rolling past. 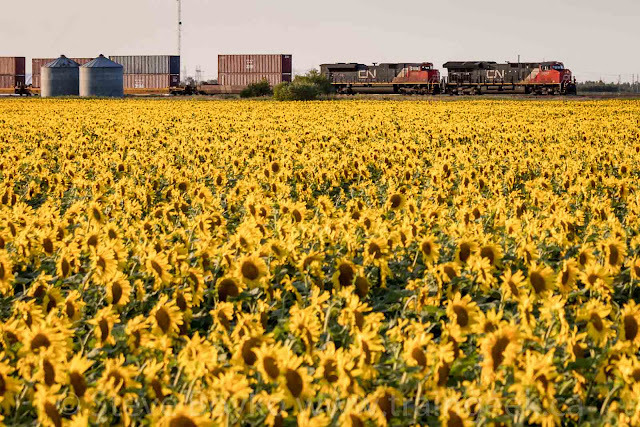 The photos toward the sun weren't as good as the "going away" photos, but I do love those sunflowers. I liked the lead photo of this post the best. 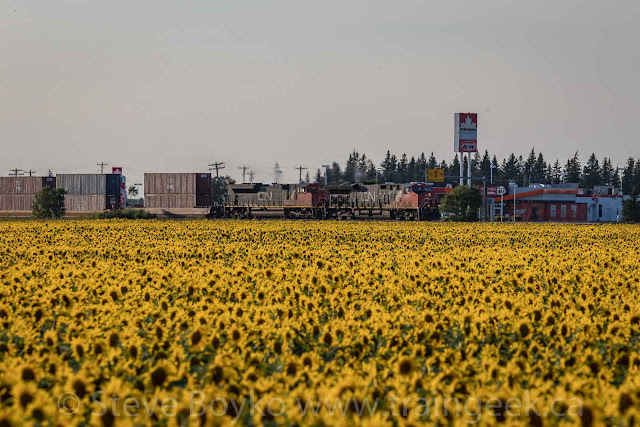 Here's one more, where I focused on the sunflowers and not the train. 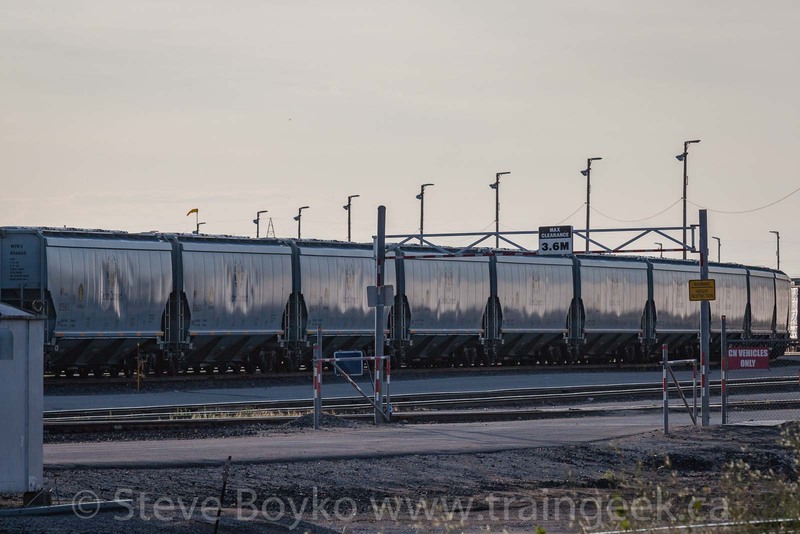 They weren't going super fast, and I had a feeling they were going to do a meet at Lorette siding just down the line. Sure enough, there was a train waiting on the main line. CN 3042 West was sitting on the main line while CN 3062 East went around them through the siding. I'm not sure why 3042 wasn't in the siding - maybe they didn't quite fit. Once the train passed, the crew of 3042 returned to their locomotive. I didn't have any time to sit and wait for them to leave, so I took a few more photos and went on my way home. 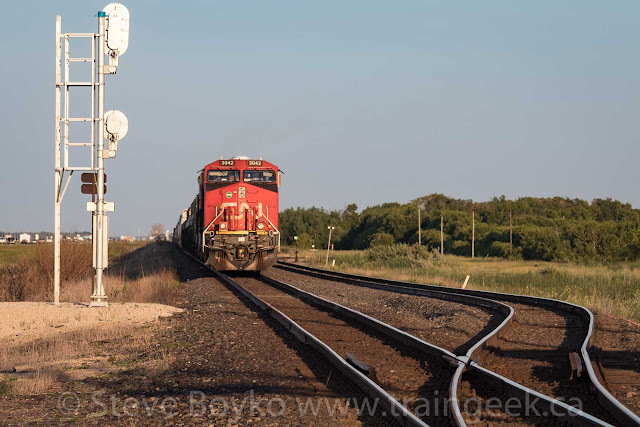 I've been adding a lot of videos to my YouTube channel, including a long video featuring the VIA Rail "Chaleur". I'd appreciate it if you'd check my channel out and maybe click Subscribe. Thanks! 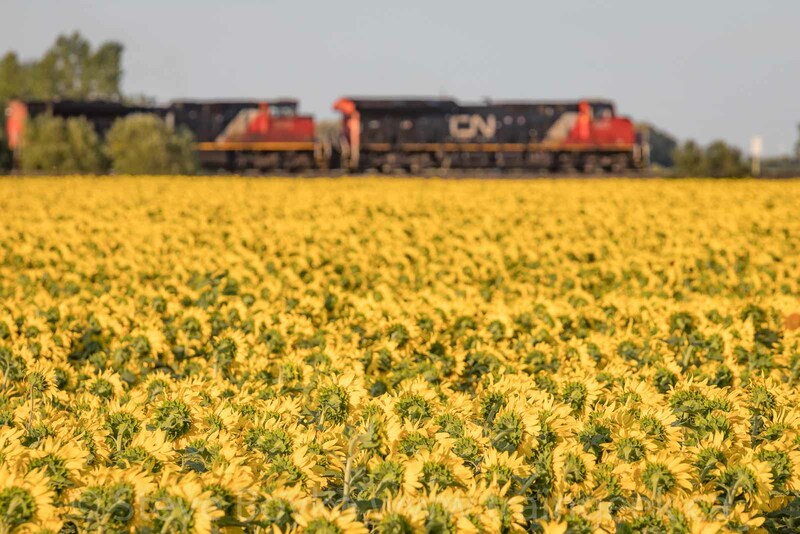 I am done finished braking for canola, now it's sunflower time! 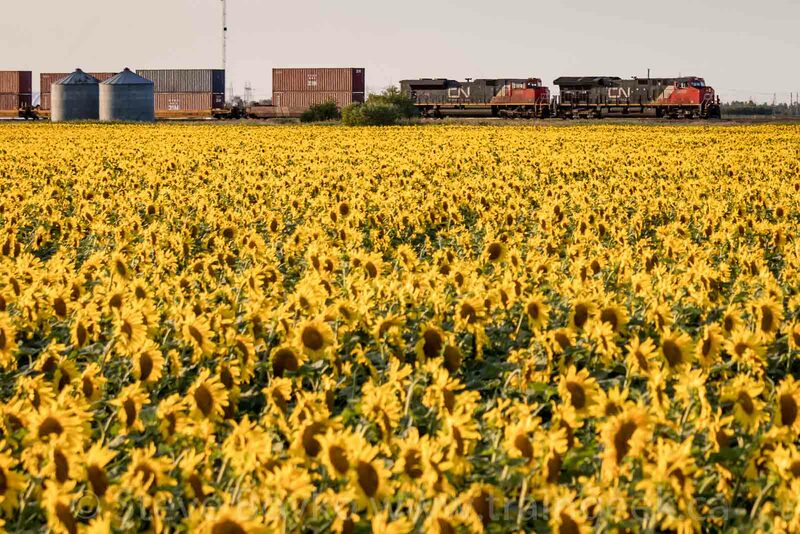 Everybody should brake for sunflowers.